Tonight's the night for All's Well That Ends Well. Last year, the Shakespeare Project of Chicago brought a staged reading of Edward III to the Illinois State University Center for the Performing Arts, with a cast that included Illinois Shakespeare Festival Artistic Director Kevin Rich and ISU alum Brynne Barnard. 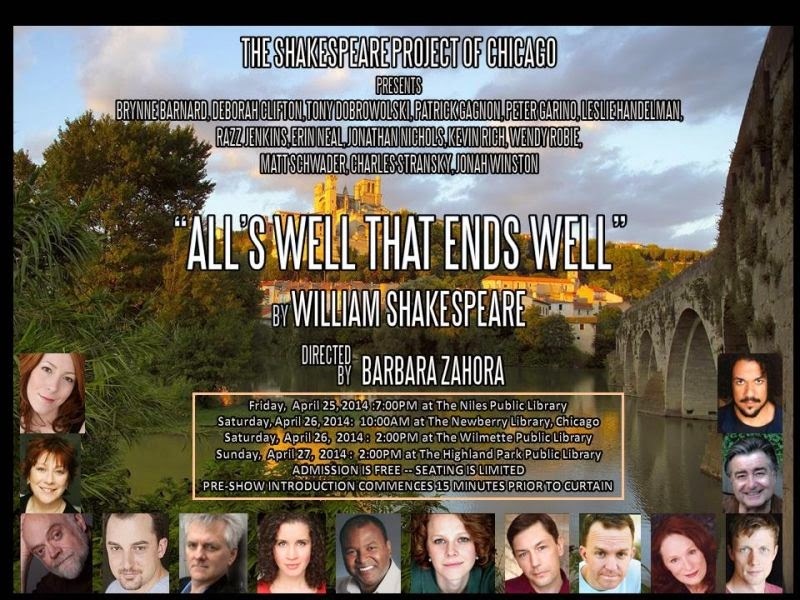 This year, the Shakespeare Project of Chicago brings a staged reading of All's Well That Ends Well to the Illinois State University Center for the Performing Arts, with a cast that includes Illinois Shakespeare Festival Artistic Director Kevin Rich and ISU alum Brynne Barnard. The Shakespeare Project has been around since 1996, with a mission to bring to life the words of William Shakespeare. The staged reading format makes it possible to use some props, some costume pieces and some design elements, but overall the actors focus on the words, as we see them perform book in hand. Or, as Artistic Director Peter Garino puts it on the Shakespeare Project website, "I often explain to people that have not seen our work before that their experience of the play won’t be less, but more because by placing our energy completely on Shakespeare’s text we allow the play to emerge in an unencumbered setting that reveals new insights into the play's characters and themes." Last year, we saw this treatment of Edward III, a play not traditionally part of the Shakespeare canon, one which has presented authorship debates for some time. In its depiction of Prince Edward and his military and personal campaigns, Edward III was reminiscent of Richard III and especially Henry V. Is that enough evidence that Edward III written by Shakespeare, at least partially? You needed to see it to form your own conclusion. But it's an intriguing notion. Shakespeare's All's Well That Ends Well has been deemed a "problem play" for several reasons. There are no records of it having been performed in Shakespeare's lifetime. The 1623 First Folio version was based on an uncorrected manuscript draft. Most importantly, the story and its characters can prove to be downright puzzling. Helena, the gifted daughter of a court physician, loves Bertram, a proud young man of noble birth. But is he worthy of her devotion? In an adventure that takes us from France to the Florentine wars of Italy and back again, we can ask ourselves what lengths we would go to for the object of our desires. Associate Artistic Director for The Shakespeare Project of Chicago, Barbara Zahora, directs. The Shakespeare Project, in collaboration with the Illinois Shakespeare Festival, will plumb the murky depths of All's Well That Ends Well and Helena's inexplicable passion for unworthy Bertram tonight at 6 pm in the Kemp Recital Hall at the Center for the Performing Arts on the ISU campus. Tickets are $10 and can be purchased at the CPA box office either by phone (1-866-ILSHAKE or 309-438-2535) or in person before the show. Note that there are separate tickets for a post-show reception and discussion and you are directed to ask about those at the box office.